My boy is Mr. Capone, or we call him Pony. I found Pony in the middle of US 19 here in Florida. He had a tag and an address. I tried to take him back twice a day for over a week. One day the neighbor of the owner comes outside and tells me they will not answer their door and I can keep him. They were crack addicts and were burning their carpet to keep the chill from their house. His name was Trigger, a common drug user name. Frankly at the time we had a 13 year old wiener dog mix and were very concerned about her health. My wife and I fought about it and she won. He was on his way out when my 18 year old daughter stepped in. She was moving out and I thought it would be a good idea for her to have some muscle company. Pony was and is very mild mannered. He does have a taste for garbage from his wandering days and hates cats. She moved out and 4 weeks later moved back in. Around this time I was diagnosed with Hep C. I was very sick from the treatments and Pony would not leave my side. As I type he is laying at my feet. We bonded and that was that. A cute story: our older wiener dog was used to laying on the back of the couch up against the wall. When we moved the couch went into the center of the floor. One day she was laying on the back sleeping and fell off. Pony happened to be laying directly under on the floor and she bounced off him and landed on her feet, almost like she meant to. Pony is now in his golden years but still loves to play and wrestle. I have three small dogs in the house, 2 sugar gliders and he loves them all. The little dogs will clean his teeth for him and he is so gentle with them. We take walks in the park and I rarely use a leash. To date, he is the best pet and friend I've ever had. He loves everyone and everyone loves him. 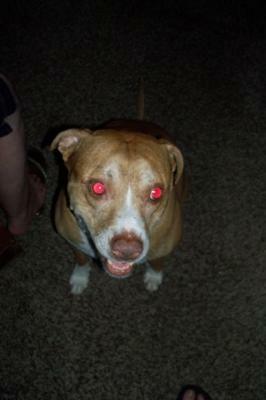 I never pictured myself as a bully owner, or a dog owner after our Queenie passed. But Pony has stepped in and claimed his rightful place in our family's hearts.